This past Summer we had lots of programs throughout the Bay Area. Kids were happy at work on their projects. 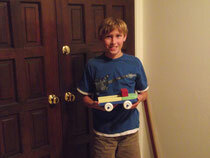 One "Happy Camper" is holding his newest treasure: pick-up truck which he built over the four-day Kids' Carpentry Camp.